Hall 5A is where you will find a host of innovative new kit at SIMA 2017 as Amazone use the event to showcase a host of new products and inno-vations in drilling, spraying, spreading and cultivating plus our favourite new topic – inver-sion tillage. 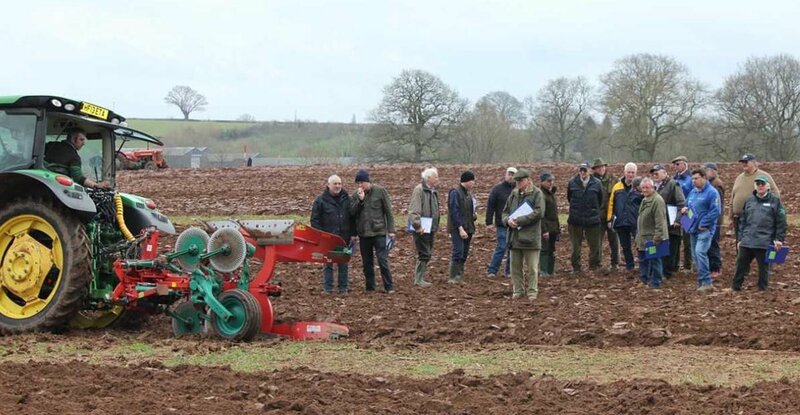 The highlight of the Show will be the new Cataya power harrow / conventional drill com-bination which uses a radical approach to gravity, peg wheel metering systems combined with state-of-the-art control technology. The half-side, automatic headland shut-off via GPS-Switch, the 1270 litre seed tank, the electrically-driven Precis metering system and impressive SmartCenter operator station which makes calibration, hopper emptying and seed variety switchover simple – and all talking via ISOBUS communication and utilising the TwinTerminal 3.0. The Cataya seed drill sits astride the new 01 series rotary harrows and rotary cultivators with packer roller guided levelling boards, centralised adjustment station and a vast new choice of packer rollers to cope with wet or dry, heavy or light and stony conditions. Seed placement is either via the new TwinTeC double disc coulter or the renowned RoTeC. The Cataya will be coming to the UK later in the year. The Cirrus 6003-2C will feature the big brother Twin-TeC+ coulter which is bigger, heavier and meatier than that found on the Cataya and is designed to cope with the higher forward speeds and greater outputs demanded of the trailed Cirrus. With everybody looking at stale seedbed preparation and wanting high work rates of shal-low stubble tillage, the Catros range has expanded rapidly in the last 12 months. Firstly saw the introduction of the neatly-folding Catros+ 12003-2TS 12 metre standard compact disc harrow and this is now joined by the Catros Special, a new lightweight 2.5, 3.0, 3.5 and 4.0 metre rigid range for the smaller tractor as well as the Catros+ x003-2TX in 7.0, 8.0 and 9.0 metre widths. This gives now 17 different Catros models, mostly all with a choice of 460 mm smooth or 510 mm serrated discs depending on the application. For deeper, heavier situations, then the Certos heavy compact disc harrow fills the gap between the Catros and the Cenius tined mulch cultivators which are designed with top soil deep loos-ening in mind. The new C-Mix Clip pin-on wearing metal system, also to be seen at SIMA for the first time, will revolutionise share changes on the Cenius. More rollers also come into the passive soil tillage world, especially with the new DW600 disc roller for those with heavy going. Automatic, GPS-based SectionControl continues to develop. The ZA-TS spread-ers now come with DynamicSpread with 128 sections, the new ZA-V Hydro, to be show-cased in Paris, has 16 sections to offer as well as the AmaSwitch and AmaSelect individual nozzle shut-off on sprayers and half-width automatic drill shut-off. These many more sec-tions bring chemical and fertiliser wastage tumbling down, cutting input costs and helping to protect the environment. You too can knock 5% off the chemical bill with AmaSwitch.